Have you taken a close look at how you’re showing up at work, in your career, and in your life? Are you letting self-doubt stop you from being a powerful leader? Are you allowing limiting beliefs to get in the way of finishing a project you care about? You have unique skills and talents that only YOU possess— It’s time to shine the spotlight on your habits, beliefs, and energies, in order to hone in on how you’re showing up in your work. I’m here to help you become your you-est you. To get access to this powerful training The ROI of Investing in YOU Masterclass valued at $49.99, pick up a copy of my latest book “Get a PhD in YOU: Business Edition” and you’ll get Free Access! When you order NOW, you’ll also receive a PDF of the first chapter so you can begin your journey right away. Master what it takes to empower yourself, own your career, and achieve the success you deserve. In Get a PhD in YOU: Business Edition, author Julie Reisler (CEO of Empowered Living and Host of The You-est You® podcast), outlines just how you can leverage principles used by nature itself–to master your habits, your thoughts, and your personal strengths–to crush it in the workplace (and life). You will also be blown away by the special guest bonus chapter written by Flourishing Leadership Institute co-founder and international leadership expert, Jon Berghoff. If you’ve enjoyed books such as How Successful People Lead (John Maxwell), 7 Habits of Highly Effective People(Stephen Covey), You Are a Badass (Jen Sincero), and The Soul of Success (Jack Canfield), Get a PhD in YOU: Business Edition is a must-read and will become a treasured part of your career- and self-improvement library. The world is ready for and in need of your crushing it in your career and in life! PLUS- Order now and get access to your free masterclass! Click on one of the bookseller link to pre-order the book. and fill out the form in step 3. Access to your bonus masterclass! Where did you purchase the book? Amazon	Barnes and Noble	Other	 Where did you purchase the book? Get a PhD in YOU: Business Edition is a must-read for anyone who wants to take their career, business and personal life to the next level. This book is a brilliant guide and playbook to help you master your inner world in order to create your ideal outer world. Most of us already know that the most important aspects of being successful are creating habits, goals and new ways of thinking that will support your highest potential. This book will give you exactly that, and so much more. 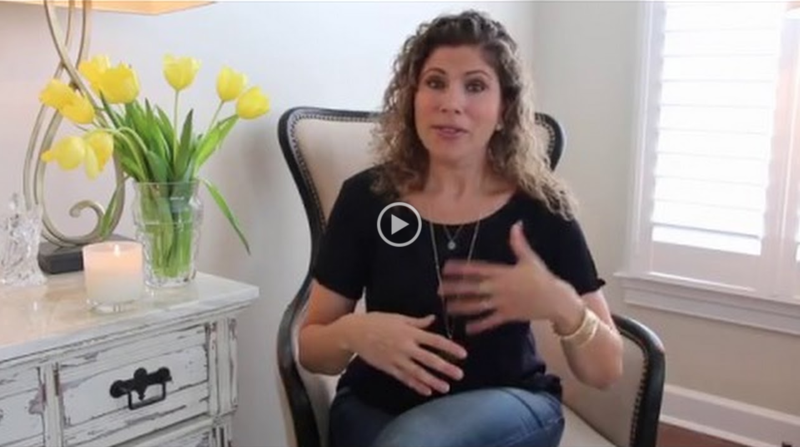 Julie shows you how to be your You-est You and leverage your strengths. If you are an entrepreneur, working on your career or wanting to monetize your purpose, Get a PhD in YOU: Business Edition is essential to your inner and outer success. We don’t always think that knowing ourselves is the key to business success, but Julie has managed to not only show how important self-awareness can be but gives us a logical path to follow. Get a PhD in YOU: Business Edition is a field guild to discovering which parts of yourself you want to bring into the world more fully. This book is not only an amazing journey but what it challenges you to uncover will change how you run and grow your business for the better. This book is a must-have for all business owners who believe that what we create in this world is a reflection of who we are. Getting a PhD in YOU: Business Edition represents a compelling opportunity that so many of us are pulled toward. 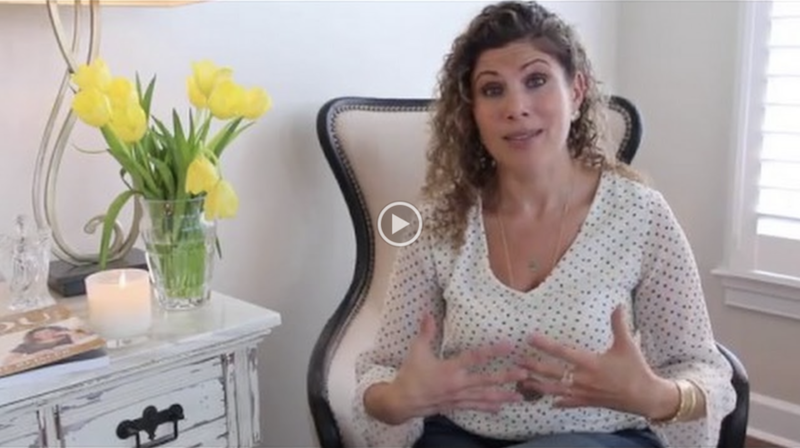 An invitation for us to ask the question – How might I connect to a deeper sense of purpose, my highest strengths, my best self, and ultimately bring forward a new vision for my future? If you resonate with the fantastic journey Julie has taken you on, that’s a credit both to the book and to you, the reader. Her questions are artfully crafted to enable powerful individual-level transformation. As a best-selling author of dozens of books, I know what a winning book is when I read it! 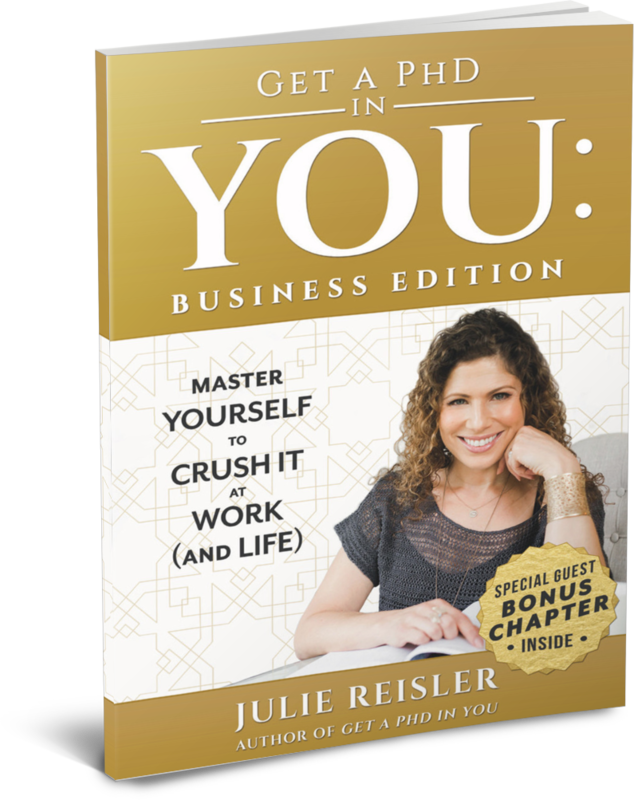 Julie Reisler’s Get a PhD in YOU: Business Edition | Master Yourself to Crush It at Work (and Life) is not only a winner, it is also a powerhouse guide for anyone looking to take their career to the next level (fast), get unstuck, and most definitely crush it in life. Ready to get a heck of a lot more satisfaction and success in your career? Then this book is a must-read! It provides the system you need to get where you want to go. Warning: Get a PhD in YOU: Business Edition will positively change your career trajectory (and transform your life). You are meant to thrive, be successful and be your You-est You®. Julie shows you exactly how to maximize your strengths, leverage your skills, and choose a life of abundance. Get a PhD in YOU: Business Edition is the playbook to help you achieve inner and outer mastery and success. Make the choice and master your career and life! Julie is an absolute badass authentic leader who walks her walk and is eager to help you thrive. You will want to read, re-read, and share Get a PhD in YOU: Business Edition with as many people as possible, as Julie reveals incredible insights, strategies, and game-changing principles that will help you take your career, and life, to new heights. The wisdom in this book is priceless and there’s no doubt after working through it, you’ll master yourself and crush it in all areas of life! 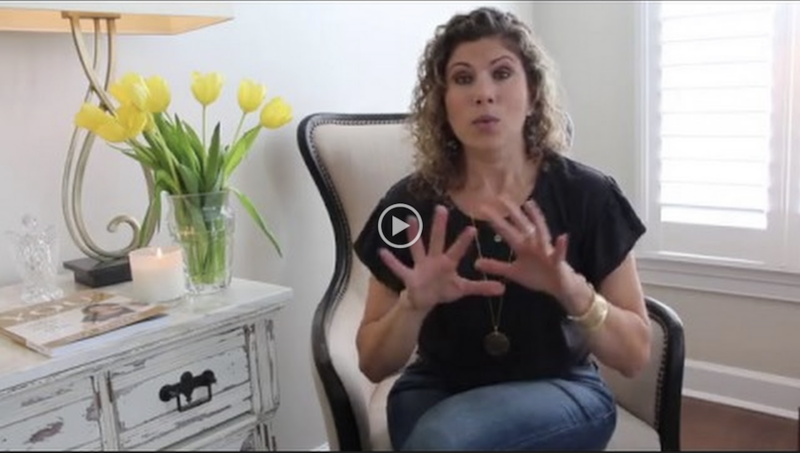 Julie is an expert on how to operate at your best, build self-worth, and live your purpose. Get A PhD in YOU: Business Edition is a business book that accomplishes all of these things, and more. Julie knows self-awareness is key and leads to self-mastery. She has helped me and countless others learn this truth: the answers you seek come from within. This book is packed with wisdom, principles, and tools to help you tap into your highest strengths and thrive in business and in life. Julie will save you the trouble of coming to the end of your journey and saying, “is this it?” She’s been there before. 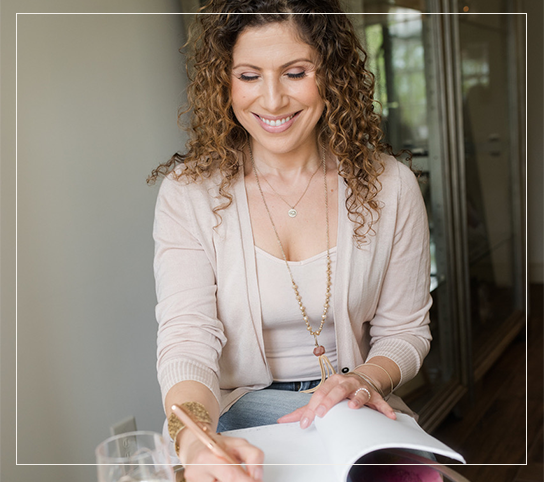 Julie Reisler is an Author and Life Designer®, as well as the founder and CEO of Empowered Living–a Life Design and personal development company. She is host of The You-est You®podcast, and has been invited to speak for TEDx on multiple occasions. Order now and receive exclusive access to The ROI of Investing in YOU Masterclass!